Of all the mysteries of the Arts & Crafts movement, one that is most confounding is why so many top makers signed only some of their work. It is possible to make reasonable guesses about the makers based on the design, different styles of hammering around the edges, clasps, stones (especially with Forest Craft Guild pieces), and workmanship. But the ones shown here will remain minor mysteries. 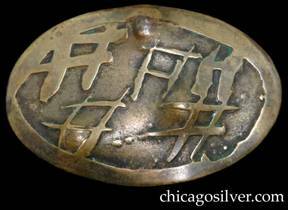 Some pieces do have marks that are hard to read, worn, or simply unknown. If anyone can identify these, we'd really appreciate it if you'd contact us. 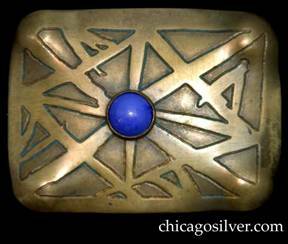 Pin, brass, large, freeform oval shaped, with acid-etched oriental-style geometric design centering bezel-set blue stone. Four repousse bulges at the corners. 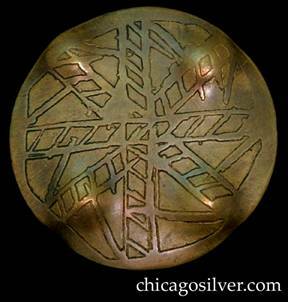 Pin, brass, round, with acid-etched design somewhat resembling ladders or an abstract snowflake. Pin, brass, large, freeform oval shaped, with acid-etched oriental-style geometric design. Bracelet, with concave curving back attached to octagonal front piece with hooked ends through slots. 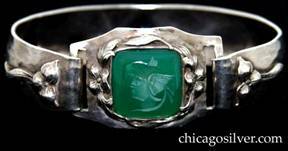 Front has green translucent square bezel-set stone with intaglio carving of Hermes. Very nicely chased and hammered applied flowers and leaves around stone and on front ends of curving back. Reminiscent of the Art Silver Shop's work. 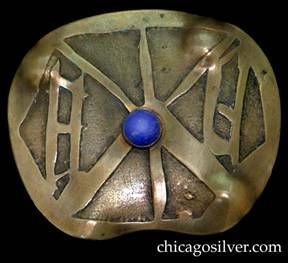 Pin, silver, trapezoidal form with applied cutout geometric designs centering a round bezel-set lapis stone. Small notches at ends. Brooch / pin, rectangular, with cutout rectangular frame and detailed applied chased and cutout pinecones, stems, and leaves centering an oval bezel-set milky mottled light green cabochon stone. 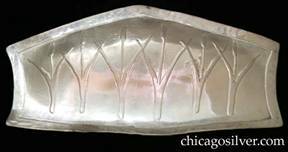 Brooch / pin, diamond-shaped with rounded corners, detailed applied chased and cutout pinecones, stems, and leaves centering an oval bezel-set milky white cabochon stone with freeform inclusions on four prongs above an oval cutout. Brooch / pin, sterling, rectangular, tapering toward the ends, centering an oval bezel-set turquoise stone ringed with twisted wire, with cutout leaves, vines, and grapes on both sides. 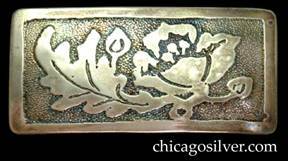 Brooch / pin, sterling, rectangular, centering very dimensional pinecone emerging from thick cuplike leaves or blossoms, inside rectangular cutout with silver beads at the lower corners. Heavy. Hammered surfaces. 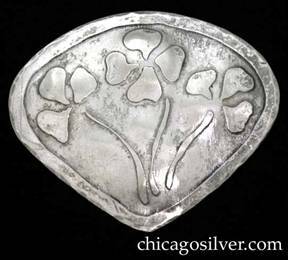 Brooch / pin, large, oval with point at bottom and acid-etched design of clovers, one of which has four leaves. From lot with other Forest Craft Guild items and very much in the FCG school. Made of polished nickel silver or silver-plated brass. Stickpin, bronze, with square acid-etched stylized floral design centering small round bezel-set coral stone. Possibly made by Forest Craft Guild.